Everything is ready for the lengthening of Grimaldi’s ferry CRUISE ROMA in Palermo. 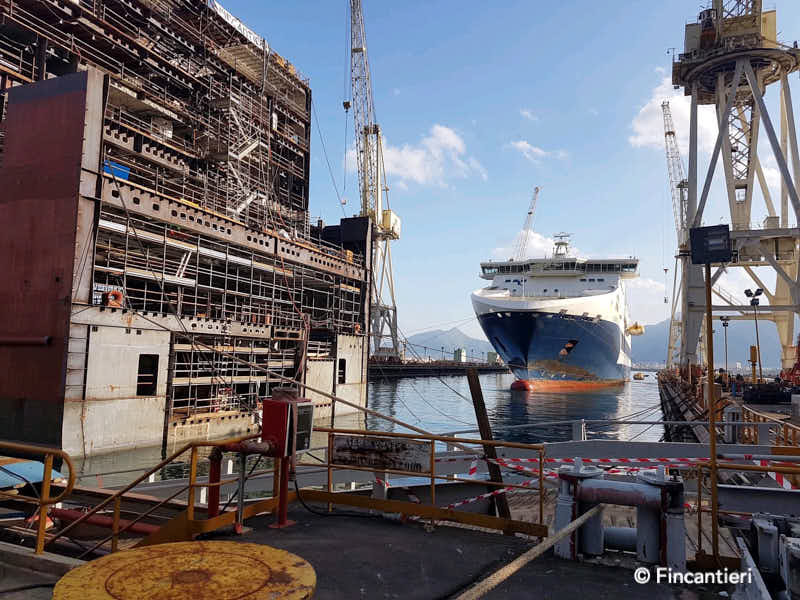 “At the end of the lengthening project, to be carried out by Fincantieri’s ship repair and conversion, part of the Services division, the ship will be about 254m long, having a gross tonnage of about 63,000 and being able to transport 3,500 passengers, with a 3,000m2 car deck and over 3,700 lane meters for trucks” the Italian shipyard said. Both CRUISE ROMA and the sister ship CRUISE BARCELONA, built by Fincantieri in 2007 and 2008 respectively, will be stretched by 29m. (this includes 600 additional freight lane meters, together with 80 sleeping accommodations in new passenger cabins and two new public spaces. The ships will also be fitted with a scrubber system, as well as a system to power the ship during the turnaround time in ports, based on mega-lithium batteries.